Last April, Instacanvas launched as an easy way to print photos from Instagram on canvas, but the company’s founders always had the ambition to expand the service beyond this first idea. Today, Instacanvas is adding rebranding as Twenty20 to reflect this move beyond Instagram– and to keep Facebook’s lawyers at bay. The Muckerlab graduate, which received $1.7 million in funding from the likes for First Round Capital, FF Angel, Bullpen and Scott Banister, is now moving beyond printing and into the stock photography space. Part of the reason for the rebranding, the company tells us, is to be able to start offering more services for brands. “The rebranding is a part of our expanding vision for the opportunities ahead,” the company’s CEO and co-founder Matt Munson noted. Enabling brands to buy its users images and especially use-generated content around their brands is the first step in this direction. 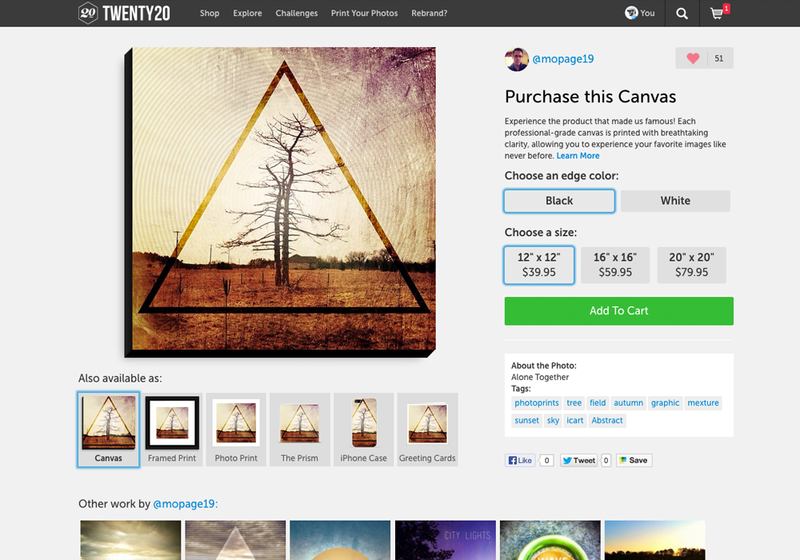 Twenty20 also plans to launch other brand-related tools, including branded photo challenges. As for the stock photography service, which is currently in beta, the company argues that despite just being 18 months old, it already has more image in its catalog than sites like Shutterstock and Fotalia. Because all of its users have already opted in to selling their photos anyway by signing up for the service, the company has essentially been quietly building one of the world’s largest stock photography sites. It already has over 30 million images in its database and continues to add more at a rapid clip.